In my mind angels come with shades of blue - maybe inspired by the movie "Der blaue Engel" (sorry, I do not know the English title) and so I knew at once, my "angels"-book must be blue - but... I wanted to use the brown paste-paper, I love the shiny surface and there was the idea: two books in one. Covers: paste-paper made with corn starch paste – blue: Fabiano watercolor paper, gouache – brown: Schoellershammer watercolor paper, watercolor and ink. Sections: Ingres Paper, writing in watercolors , with metal nibs. 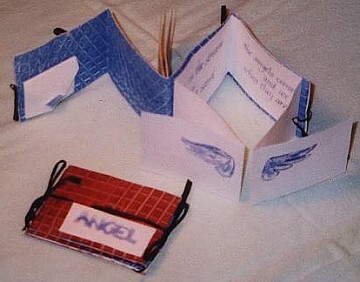 Angel wings and print: self-cut rubber stamp.